As I’ve noted before, Instructables has changed their business model, reducing access to content to non-paid visitors. Since all of my work was published under a Creative Commons non-commercial license, I’ve removed it from Instructables and am republishing it here, so the content stays free. Chocolate bath melts – chocolate that’s good for your thighs! Chocolate Bath Melts - Chocolate that's good for your thighs! 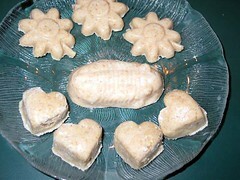 Bath melts are fruit or nut butter melts for soaking in the tub. The added ingredients will leave your skin soft, detoxified and smelling terrific. 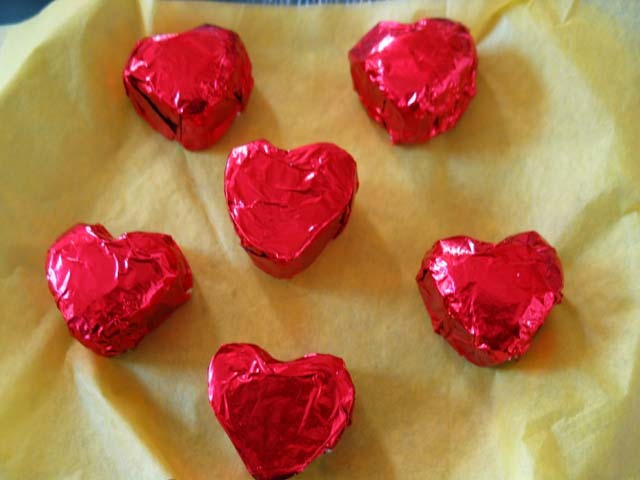 This particular batch I made for valentine’s presents, hence the chocolate scent and red foil wrap. 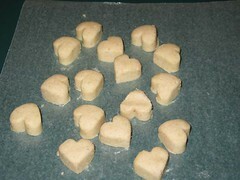 You can scent them with any essential oil or fragrance, and do them in any mold, even an ice cube tray. This is a kid safe project (as you can see by my assistant Igor), and the results are kid safe. And what parent doesn’t love things that will get your kids in the tub? 1/2 cup Shea butter, cocoa butter, mango butter (any solid at room temp fruit or nut butter). For this project I used Shea butter. Something to use as a mold. This batch is about perfect for filling a standard ice cube tray. I used a food processor to make this entire batch, but you can do the grinding in a coffee grinder, or if you happen to have a mill in your back yard, throw it under the stone and spur on the donkeys. 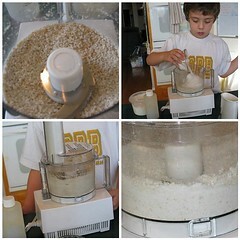 Whatever method you use, you want the oatmeal to be ground fine enough to be kind of fluffy. 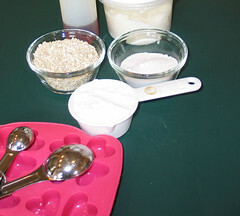 Then add each of the other dry ingredients, mixing well between additions. 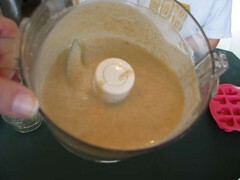 After all the dry ingredients have been added, blend well. 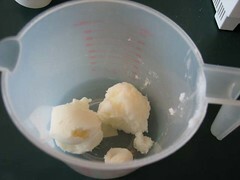 Melt your butters, on medium heat in the microwave for about 90 seconds, checking after 1 minute. If, at the end of 90 seconds, you still have a few solid bits, stirring should melt them. You don’t want your oils to get so hot that they start to cook. 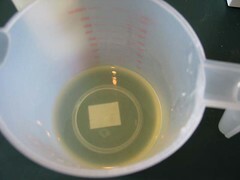 Once the oils are melted, stir in the fragrance oil. Pour (or scoop) your mix into your mold of choice. Tap the mold lightly against the counter to release any air bubbles. Let your melts cool to room temp, or to speed things up, you can pop them in the fridge for an hour or so. Note that if you do the fridge trick, you may see some citric acid activation on the top of the melts if they get condensation. Once the molds feel solid, you can unmold them on to wax paper or a plate. I wrap these in candy foil, because candy foils come with a wax paper backing, which will keep the butters from sticking to the foil. I store my extras in the fridge. Keep in mind that these melts are semi-solid at room temp. If you hold them in your hand, they will melt. If you put them in the sun, they will melt. If you leave them anywhere with an ambient temperature above about 76 degrees Fahrenheit, they will melt. If you think carnal thoughts while in the same room with bath melts…they will melt. Do not taunt bath melts, they will melt. Directions for use: Draw a warm bath. (Fill a bath tub with warm water.) Plop a couple of these in. They will melt. Enjoy your yummy buttery bath. Use caution when exiting the tub. Dry carefully. Prepare to defend against chocoholics who try to nibble you. Unless you want to be nibbled. In which case, you may melt. Great guide. I especially loved the part about wanting to be nibbled at the end. Well done, I’m looking forward to trying this recipe! Thanks! I’d love to see pictures when you’re done! 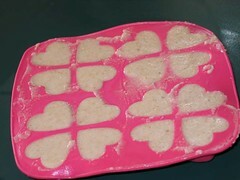 Could you please tell me where you bought the heart shaped mold for the chocolate bath melts? It is a lot deeper than the molds I’ve seen.